PICNIC Friday, 5:30. Many DM photos. Articles about events are in chronological order this time. Unless otherwise noted, they are written by Mary Mullen. Red headlines = Neighborhood event or news. Sunday night – 6 p.m. Sunday to 5 a.m. Monday (Aug. 10). 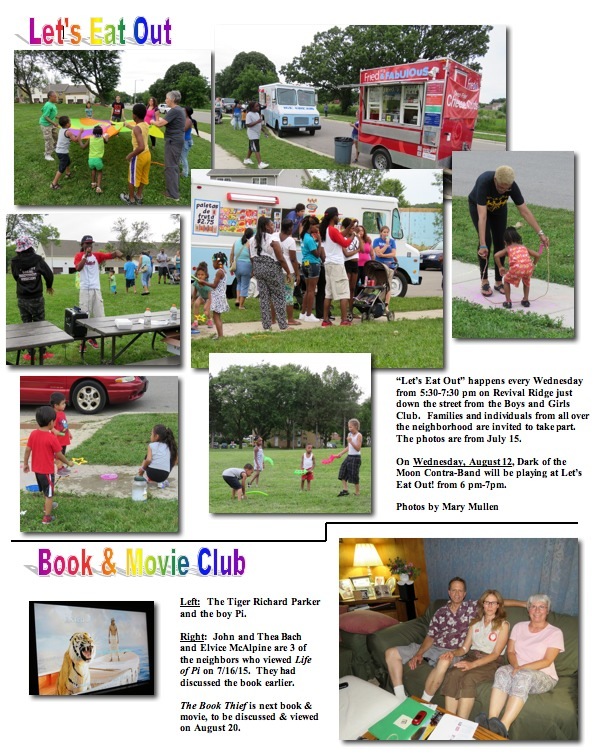 See a map on Facebook either on the “Dunn’s Marsh Neighborhood Association” page or the “WI Verona Road Project” page. Trees have been dug in and are flourishing and grass carpets most of the median and edges of the road. This signals the near end of Stage 1 of the Verona Road project. Still, as anyone from this neighborhood knows there’s a tremendous amount or work left to be done to complete this large road project involving the Verona Road/Beltline intersection. 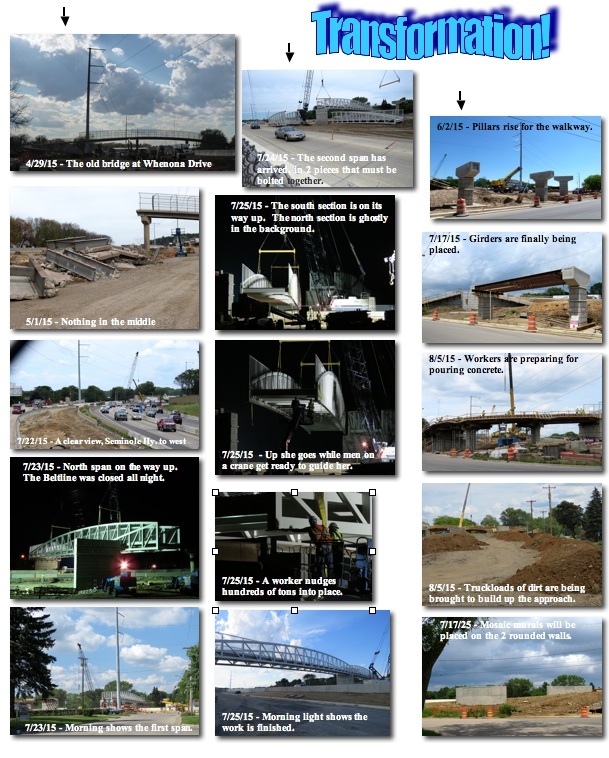 The question is, will it be finished soon, or will it be delayed because of the Wisconsin state budget and our governor’s presidential ambitions. She went down on the first of May. Now she’s well on the way to being rebuilt on a slightly different orientation. I’m talking about the pedestrian bike bridge that crosses over the Beltline near Whenona Drive. 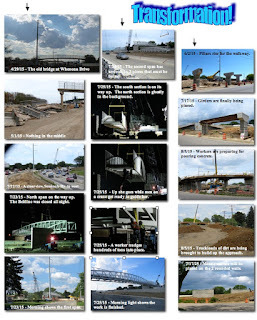 See the transformation from old to new by viewing the attachment. If all goes well, we should to be walking or riding over the new bridge within a month. My name is Jodie Pope and I work for the South campus of Madison College (MATC). 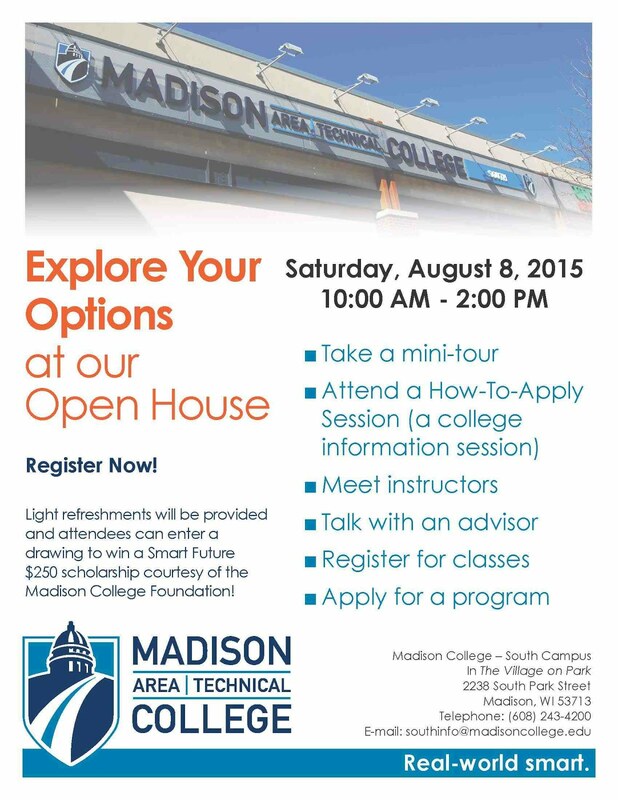 Our Open House is scheduled for August 8th and I wanted to share it with your communities. 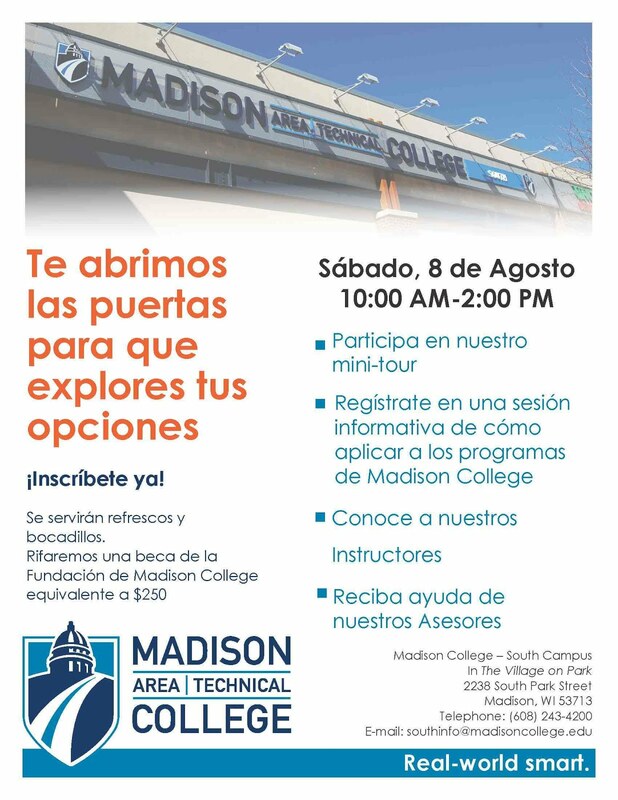 Our Open House will have information on our programs, tours, advisors, and those who want to apply to school that day, an opportunity to have their $30 application fee waived. Details on the attachments. Second one is en español. My name is Dena Carreyn, and I'm the Dane County International Exchange Coordinator at EF High School Exchange Year. EF is currently seeking Madison area families willing to host students (ages 15-18) for the 2015-16 school year. These students will be arriving in late July / early August, so the clock is ticking and I need to find host families ASAP! I'm hoping you can help me spread the word about our program to your neighbors, friends, and family. Please feel free to forward this email to anyone who might be willing to host! If you are interested in hosting, please contact me directly. I would be happy to answer any questions and/or forward profiles of our students so you can pick the best match for your family. Let’s Eat Out! is a way to bring neighborhoods together through food. There are 16 of them every week this year, and one of them is in our neighborhood every Wednesday, from 5:30-7:30 pm. Come on over to 2320 Revival Ridge, just down the street from the Boys and Girls Club. There will be food carts where you can buy food, free local produce, free children’s activities, and free entertainment by local performers. 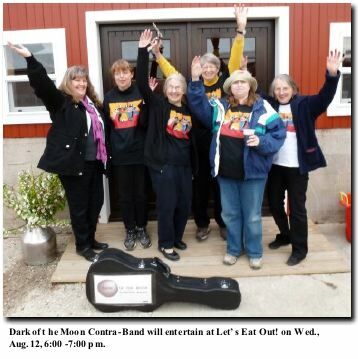 On Wednesday, August 12, the entertainment will be provided by Dark of the Moon Contra-Band from 6:00 pm - 7:00 pm. The band has 6 members and will play polkas, reels, jigs, rags, waltzes, and more for your listening or dancing pleasure. Bring a lawn chair if you want to sit. As usual, the DMNA Council will meet on the second Thursday of the month. This month the date falls on August 13 - also the 10th in September. Residents are welcome to attend. If you have a topic you want the Council to discuss, please contact the President in advance. See masthead for contact details. It’s a topic that no one likes to think about, but can be one of the greatest gifts you leave for your loved ones to help comfort them during the difficult time. Making your own advance funeral arrangements can seem daunting, but presenter Teresa Westing, MA, affiliated with Cress Funeral Home and Cremation Services, has some great tips to help you help your loved ones. This program, sponsored by Supporting Active Independent Lives (SAIL) will be held at Oakwood Village - Heritage Oaks on Wednesday, August 19th at 2:00 p.m. 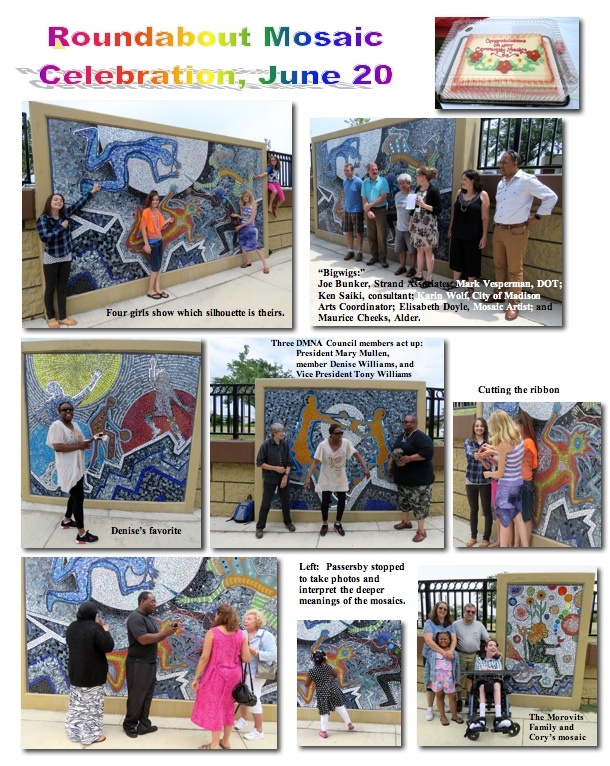 The program is free of charge and open to the public. Call 608-230-4321 to register! On Thursday, August 20, the neighborhood book club will meet to discuss The Book Thief by Markus Zusak and see the movie. Meet at John and Thea Bach’s home, 1905 Danbury Street, 6 pm, and bring food to share. The Book Thief centers on the life of Liesel Meminger, a nine-year-old girl living with her adoptive family in Germany during the Nazi era. She is taught to read by her kind foster father and begins sharing them with the Jewish refugee who is being sheltered in the family’s basement. Young Liesel's experiences are narrated by Death, who details both the beauty and destruction that life in this era brought. It’s a book you won’t want to put down once you get through the first few pages. It has won many awards. Get the book directly from Thea Bach or by going to the book club section of the main library. Books are alphabetical by title there. For more information about the meeting, contact Thea at bachtown2@live.com or at 239-9810. Both are also noted on the Facebook page of the Dunn’s Marsh Neighborhood Association. 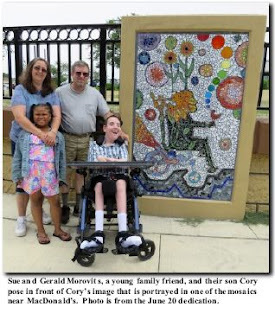 Sue Morovits wrote this testimonial to her Facebook friends on June 3, 2015, after a series of photos on the Dunn’s Marsh Neighborhood Association page showed the wheelchair mosaic being installed piece by piece on the wall near MacDonald’s. A friend had asked her how the mosaic came about. I live in Dunn’s Marsh neighborhood and they were doing this roundabout under Verona Road. They decided to do some artwork using kids from the area, and my neighbor Mary asked me if I would like to do an outline of Cory with the understanding it wasn’t a guarantee his would be picked. They could only pick so many kids’ artwork. We got lucky, and they picked Cory’s. We did help a couple of days. It was a blast, and he had fun with the kids. It makes me feel a litte more a part of my neighborhood, even tho there are areas that still need to be worked on. I’m proud that Cory was picked. It was hard doing the drawing: had to lay the chair on side, then once that was done, put the paper on a wall, then put Cory in his chair, put a light behind Cory, get the right size, then draw him. Most of that [the design] is my idea but a teacher that is doing this … added more to his [mosaic] like the flames and the bubbles and the bird and the flower above his head. They are doing an unveiling the 20th but let’s see when hubby uses that roundabout if he notices this or if they will cover it up. Not even sure if you can see it from that direction he would come from which is Home Depot, but we will see. Einstein’s Bagels property owner Pat Roberts informed us that she had sold the former Einstein’s lot and the location would open as a Chinese restaurant by late summer/early fall. In mid-July, the whole neighborhood could see that when a banner proclaiming “Great Wall Chinese Restaurant Coming Soon” appeared on the front of the building at Britta Parkway and the Verona Frontage Road. Looks like we will soon have another place to eat in our neighborhood to complement MacDonald’s. A badger, not a fan, but a real live fierce badger has taken up residence in the neighborhood. Neighbor Mary Somers, who lives in The Preserve on Crescent Road, discovered that a badger made its den in a retaining wall of boulders at the corner of her building. Not only that, but it terrorized her little dog and has also been seen on The Cannonball Path. Although her latest information is that it may have moved to somewhere on the Cannonball Path toward the nexus of trails at the high bridge, she’s still keeping a lookout for it every time she walks the path. It could be dangerous to walkers and bikers, she thinks. The Dunn’s Marsh Neighborhood is a haven for wildlife as well as people. Over the spring and summer months, anyone outside with half an eye open can catch some of it. 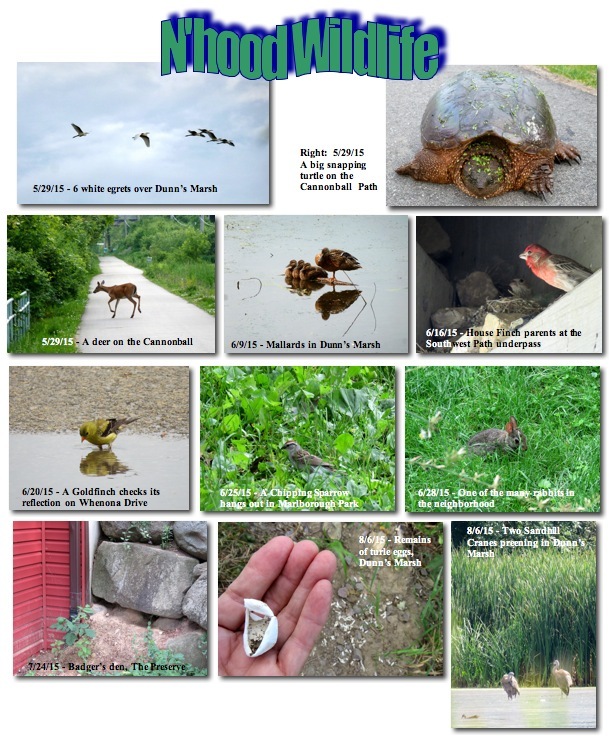 If you keep tabs on the neighborhood through the Dunn’s Marsh Neighborhood Association’s Facebook page, you would be aware of a lot of wildlife. 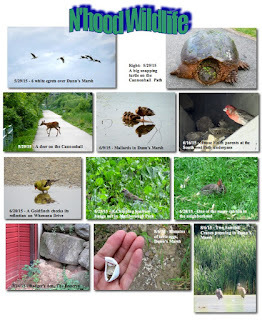 For those who are not Facebook friends of the DMNA, the attachment shows some of the wildlife you could have seen there. 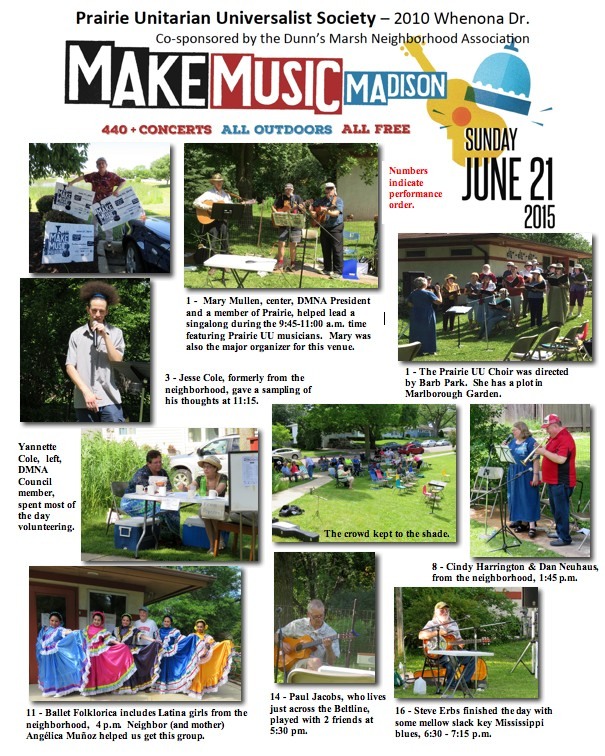 You couldn’t have asked for a nicer day for the 9 ½ hours of outdoor free music at the Prairie UU venue than the solstice on June 21. The weather was sunny all day, music began at 9:45 am and didn’t stop until 7:15, there were ample volunteers, and every group had a chance to accept some remuneration for their time. 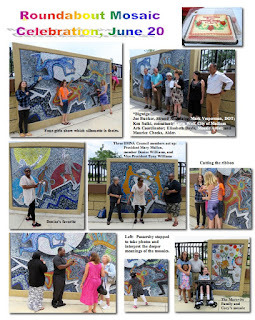 The venue was co-sponsored by the Dunn’s Marsh Neighborhood Association and Prairie Unitarian Universalist Society for the third year in a row. The audience swelled to 71 at one point. Some 48 people were present shortly after the 9:45 start time and 56 were there by 10:25. Other high points were 65 at 11:30 am for Helen Avakian & Dave Irwin playing fingerstyle guitar, 71 at 12:15 pm for Guitars for Vets, 52 at 1:00 pm for Dark of the Moon Contra-Band, and 39 at 4:35 pm for the Raging Grannies. The audience never sank below 16 and was usually at least in the 20s and 30s. singing groups of various sizes, and a Latina dancing group, Ballet Folklorica which featured young girls from the neighborhood. Heart-felt thanks for a successful day go to many people. A baker’s dozen of DMNA volunteers leafletted the neighborhood with nearly 600 flyers: Kim Zinski and daughters Sage and Olivia, Sharon Grant, Thea Bach, Pam Flinn, David Martin, Rachel Potter, Mary Mullen, Donna Sarafin, Tony Williams, Mary Somers, and James Luscher. A combo of Prairie and DMNA volunteers put up the many signs to direct people to the site and took them down after the event. During the day, volunteers were mostly from Prairie, but several from the neighborhood also helped set up or kept things running smoothly during the day including Yannette Cole who worked like a trooper, Mary Mullen, and Caron Beaudoin. Due to passing the bucket in person during each act, the day was a financial success as well with $471.70 taken in during the day. From this amount the performers ‘ take ranged from $4 to $62. Prairie - because of the “offering” and donations from some of the musicians - took in $118.50. 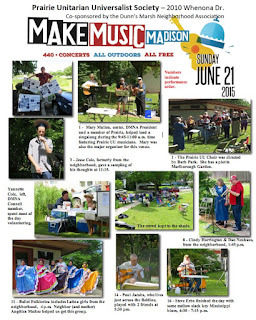 In the end $53 went to Make Music Madison and the Dunn’s Marsh Neighborhood Association got $60.54 which included about $21 in sales of bottled water. 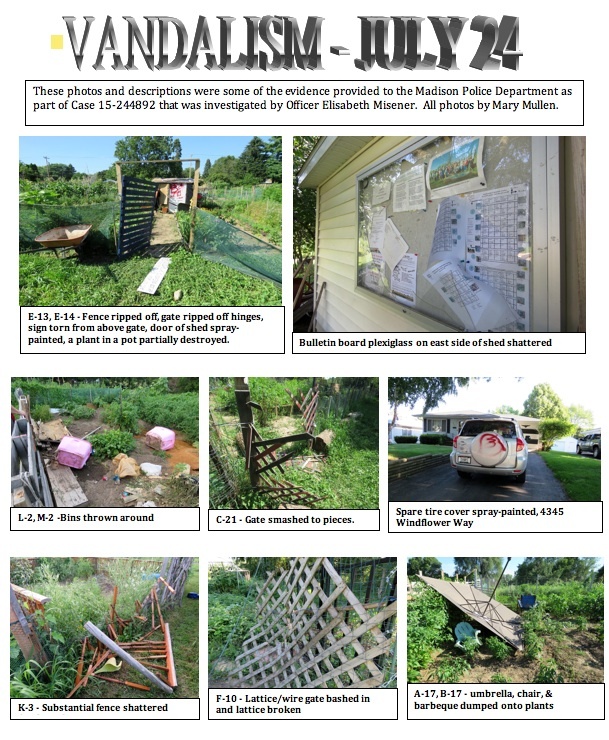 On the afternoon of July 24, vandals did a tremendous amount of damage, both minor and major, in the Marlborough Park Community Garden. They also spray-painted a tree in the park near Windflower Way and the spare tire cover of a vehicle close to the park there. The damage in the garden included knocking out the window in the garden shed, breaking the bulletin board window, breaking up several gates, tearing down fences, spray-painting the door of one gardeners’ shed, lopping off, knocking down, or pulling out garden plants, and yanking out newly planted fruit trees. One gardener saw the vandals after he heard some noise and went to see what it was. 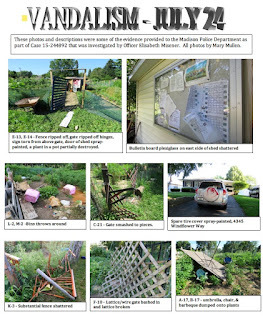 That gardener gave descriptions to the investigating Madison police officer, Elisabeth Misener. To his shock, the gardener saw one vandal whipping down plants in a garden, then saw 5 boys he estimated as ages 8-11 running off after he told them he would be calling police. Officer Meisener spent at least an hour looking at the damage and interviewing people whose property had been damaged. She noted that she wasn’t allowed to take photos for evidence, but would welcome others doing so. Mary Mullen, who had actually called the police, accompanied Officer Misener, taking photos. Further damage was discovered and photographed later. The photos, along with a detailed list of the damages, is now a part of the evidence files. This is case #15-244892. For your information, West Police District statistics for July indicate that this damage occurred at the most common time for police calls during July, on a Friday and around 4 p.m. The WPD charts also show that the West District had 5,026 incidents during July 2015 as compared to 4,708 incidents in July of 2014. You live here and therefore have a stake in the neighborhood. Plan to come to the annual meeting of the Dunn’s Marsh Neighborhood Association to talk about your concerns and ideas. The annual meeting is scheduled for Thursday, October 15, probably starting at 7 pm, maybe a bit earlier. Get this event on your calendar now, and then come help us make the Dunn’s Marsh Neighborhood better.